HI all. Im after some advise if poss. I am involved in a project, where we have recently had to remove the clad from some alluminium stressed panels, because the clad was corroded badly. The panels themsleves are stressed panels, rich in copper and, magnesium alloys. We have buffed the bare ally panels to a high finish. However without the protection of the original clad layer, they start to stain with corrosion blotches within a matter of weeks, which will quickly develop into pits if left unchecked. 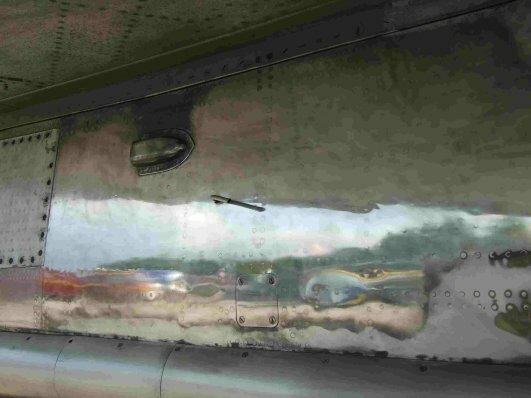 My question is, the panels are part of an aircraft display monocoque structure and cant be removed, so apart from Allochrome etc, what options are available, to stop the onset of this corrosion, without constant polishing. Polishing will wear the panel thickness down eventually.? Allochrome looks awful since it leaves the panel gold, and would come off with polishing anyway. To get this clear in my mind The original parts were pure aluminium clad high strength aluminium alloy, now with the more corrosion resistant cladding removed. I assume you want to keep to the original appearance as closely as possible. Bit pressed for time, so I will just give my initial thoughts and come back later if I can think of anything better. Clear lacquer, probably need some form of surface activation/priming to get good adhesion. Would need to regularly inspect though, when lacquer fails, danger of localised pitting. Thermal spray aluminum coating, would require grit blast preparation and some hard work finishing. Not sure if your panels are thick enough for this treatment though. Probably the only way to get close to the original cladding. Anodising is a thought, not sure if this can be done using swabbing type electrodes. HI gordon, many thanks. yes exactly, the corrosion resistant cladding has sacrificed itself to a point where it was pitted to hell, almost gone infact. the panels themselves are about 2mm mm thick, and highly stressed. We would like to keep the original look. We have thaught about two part epoxy clear acid chromate paq laquer. The trouble is the paint manufacturer tell us that we have to key the ally first, like any other acid chromate.So that defeats the object, as we will have to remove the luster it has now. 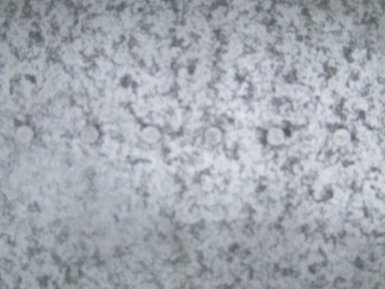 see attached photos, they are very low res, but you can see the generals, 1st is the panel with severe clad pitting, before we removed all the corrosion. 2nd is during surface finishing.. This is how it looks now. The other option we have thaught about is this fan dangled paint maclaren are using on their f1 cars, which looks like a metal finish. that would be a shame though. Imported your pics, made them smaller to view here. hope that's ok. Difficult one. I think initially I would try a good clear lacquer and keep my eye on it. At least you shouldn't damage what you have and easily removed with acetone like solvent and re-coated fairly cheaply. Certainly, probably not very long term protection and will need redoing at the first signs of failure. As with all paint/lacquer systems, localised failure can lead to quite aggressive pitting type corrosion under the paint/lacquer, which could be worse than not having a coating at all. If its out of sight and mind I wouldn't use this. hmm, trouble is laquers wont adhere to the shiny finish, so thats out unfortunately, and acid etch type laquers would require the surface to be preped with phosphoric solution or deoxidine 200, which both remove any shine. It seems that the alloy itself is pretty exotic, to pit so quickly, I can only assume its the high copper content that causes this? other areas dont have this issue. ACF50 oil, stops it reacting at all, so it has to be reaction with the open air, rather than inside out, if you know what I mean. Its a real head scratcher this one.. I appreciate your problems. At the moment, I can only really think of temporary measures (lacquers, oils or waxes), that will require frequent inspection and re-application, without the need of removing part and expensive treatments.